Take a slice of cashew, almond, pistachio and mushroom roast and pour over the rich port gravy. A great vegan alternative. Onion, Mushroom (12%), Water, Cashew Nuts (9%), Chestnut Mushroom (8%), Premium Harvest™ Breadcrumb (Country Ground™ Fortified British Wheat Flour (Wheat Flour, Calcium Carbonate, Iron, Niacin, Thiamin), Yeast, Salt), Almonds (5%), Spinach, Dried Cranberries (5%) (Sugar, Cranberries, Sunflower Oil), Marsala Wine, Extra Virgin Olive Oil, Garlic Purée, Pistachio Nuts (2%), Tawny Port, Vegetable Stock (Glucose Syrup, Dried Vegetables (Onion, Leek, Potato, Garlic), Water, Salt Sunflower Oil, Flavouring), Carrot, Redcurrant Jelly (Brown Sugar, Water, Concentrated Redcurrant Juice, Concentrated Lemon Juice, Gelling Agent: Pectin), Mushroom Stock (Mushroom Concentrate, Water, Sea Salt, Onion Concentrate, Rapeseed Oil, Sugar, Cornflour), Tomato Purée, Yeast Extract (Barley), Cornflour, Rapeseed Oil, Red Wine Vinegar, Thyme, Black Pepper, Gelling Agent: Pectin; Roast Barley Malt Extract, Salt, Porcini Mushroom Powder. 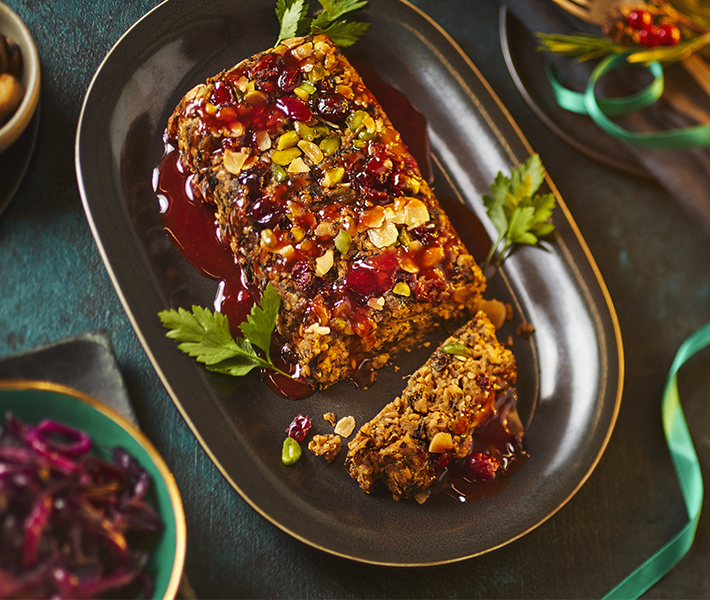 Mushroom and chestnut mushroom nut roast with cashews, almonds and pistachios and a redcurrant and port gravy. Nut roast - oven cook from chilled. Redcurrant & port gravy - microwave from chilled but can also be heated on the hob. Although extra care has been taken to remove shell, some may remain.